The Jewish holiday Hanukkah is an eight-day Festival of Lights commemorating the rededication of the Holy Temple in Jerusalem. Central to the holiday is the menorah. Architect Richard Meier designed a Hanukkah lamp for an exhibition at the Israel Museum entitled Nerot Mitzvah: Contemporary Ideas for Light in Jewish Ritual. 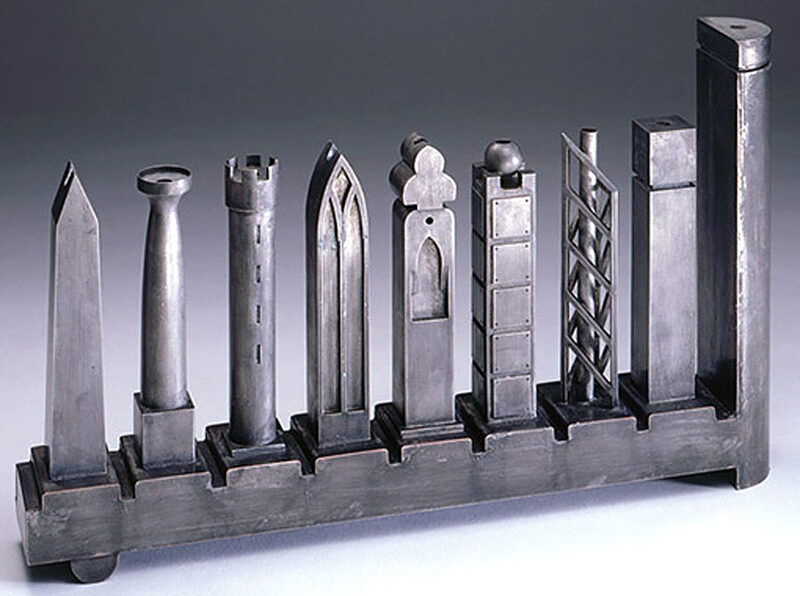 This pewter menorah with architectural themes measures 8-1/2 x 14 x 2 inches. Meier wrote, "In the design of the Hanukkah lamp, I was trying to express the collective memory of the Jewish people. Each candleholder is an abstracted representation of an architectural style from significant moments of persecution in the history of the Jews. These are not intended as literal representations of specific events but rather as reminders of the common past and struggles that Jewish people have suffered and their resilience and strength that is so wonderfully captured by the Hanukkah story." An original of this menorah, in tin-coated copper, is in the permanent collection of The Jewish Museum. It has been reproduced in a limited edition of 500 units in pewter. Other menorah also have building and architect designs. A replica of the 15th-Century Great Synagogue in Toledo, Spain is made of resin and measures 15 x 9 x 6 inches. The white arches are portion of one of two remaining Synagogue buildings left in Toledo, once the capital of the thriving Jewish community of Spain. Another item of Judaica was designed by Heather Goldminc. The Jerusalem Village menorah holds Each candle within a small cityscape with the center building being the temple. Standing 12" long x 4" tall, the hand-painted ceramic menorah holds standard Chanukah candles.